One of my favorite things about living in a city like Atlanta is the abundance of estate sales just outside of my doorstep. Not only is our neighborhood just across Peachtree from some of the most beautiful homes in Atlanta, but we happen to be in the heart of estate sale territory. Unfortunately, travel, company, and sleeping in work all seem to get in the way of me rising early on a Saturday and heading to the sales around my 'hood. So instead, I've come to rely on Everything But the House for shopping Atlanta estate sales without leaving home. Everything But the House is officially in the Atlanta market and happen to have not one but two sales going on this week. At Everything But the House, all bidding starts at just $1 which means there are great deals to be had on everything from furniture to glassware (no sniping either!). If you're in Atlanta, you can save on shipping by picking your purchased items yourself which is perfect getting the instant gratification of estate sale shopping without having to barter with the seller in person. Imagine the savings on larger pieces of furniture! And, if you're a new bidder, you'll get $20 just for signing up with EBTH.com. Done and done. 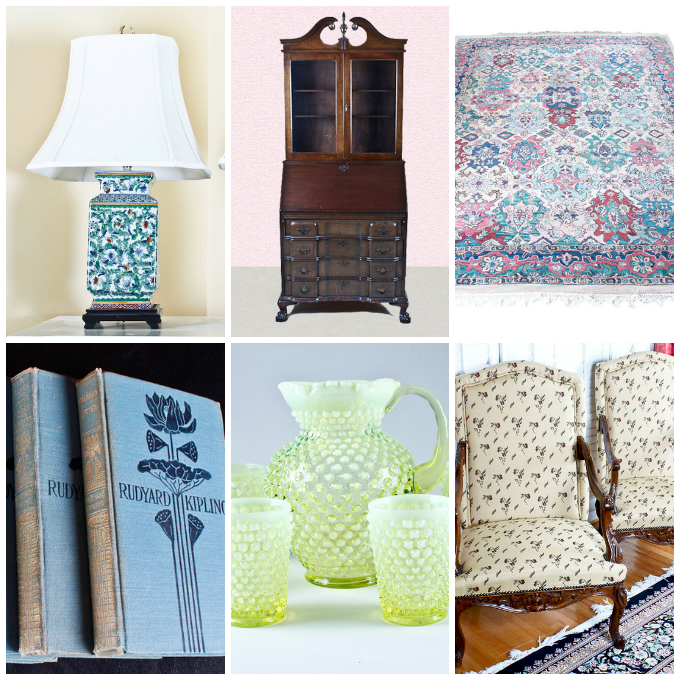 This week's Atlanta sales feature some beautiful pieces including a pair of ceramic lamps, a stunning Chippendale secretary's desk (imagine it in a punchy color! ), an Indian style area rug, a first edition Rudyard Kipling books (I'm a book hoarder, did you know? ), a lovely Fenton set (it's just like this one from Anthro), and a pair of chairs that can easily be recovered and added to my new office. Lucky for you, Everything But the House is offering a $50 gift card for you to try your hand at finding your own estate sale goodies. Enter below to win! Thank you to Everything But the House for sponsoring this post. All opinions are my own.